Bitcoin is an exciting field to be a part of because it’s new, it’s innovative, and it interests a broad spectrum of people. From traders to programmers, economists to venture capitalists, bitcoin has made a big splash by changing the way we think about digital money. As a result of such widespread interest as well as its novelty, many people have heard of bitcoin but know little more than that. Of course, when people associate bitcoin with drug dealers, they’re probably remembering what they heard about the Silk Road, the online black marketplace where you could buy drugs and other illicit items ‘safely’. Needless to say, the site was taken down October 3, 2013 by the US Federal Government. The site owner and creator used the pseudonym Dread Pirate Roberts was arrested by the FBI and his identity revealed to be Ross Ulbricht. Since the seizure of the Silk Road, no similar websites have gained traction, bitcoin has grown exponentially in value, and its use in illicit activities are negligible. Certainly not! One of the last major news headlines that people who only follow mainstream media recall is the bankruptcy of the exchange Mt. Gox. Due to a reported flaw in the Mt. Gox internal accounting system, some people took advantage of being able to doubly withdraw their bitcoin. This flaw was exploited repeatedly by a select few individuals until Mt. Gox management realized they were in a $400M hole, suspended operation, and shortly thereafter declared bankruptcy. Bitcoin itself has never been hacked and the other major exchanges remain stable. I always laugh when I hear this one, because the individual likely doesn’t even know what a Ponzi Scheme is! A Ponzi Scheme is a fraudulent operation that pays returns to its investors by raising funds from subsequent investors rather than running a profitable business. Bitcoin is not a business and does not guarantee returns for investors, nor is it run by an individual or central authority. It is a free, decentralized software that allows people to transfer value safely and securely. Before the collapse of the Silk Road, people felt safe using bitcoin because it was ‘anonymous’. In truth, bitcoin is not anonymous and never has been. More accurately, bitcoin is pseudo-anonymous by definition in that every wallet can be uniquely identified but not necessarily easily associated with a person. Think of it like e-mail: if you create an address called anon123@mail.com you could easily send people mail without them knowing who you are. But the minute you tell someone your identity, then every mail you sent from that address becomes identified as from you. I like this one because I’m indirectly referred to as a genius. I’m not exactly sure what people are thinking about when they hear this, but likely they are just bewildered by the concept of bitcoin. Which is completely understandable, bitcoin is confusing! But it’s not a game, and you don’t need to be a tech genius to play. And addressing the component of value, bitcoin does have value. People exchange bitcoin for goods, services, and other currencies. This gives bitcoin value which right now hovers around $600 per bitcoin. When people say this, they have probably heard of miners but don’t understand what they do. Miners verify the transactions of the network and validate that the sender has sufficient funds to transfer bitcoin to the receiver. In compensation for their efforts, they are rewarded with the creation of new bitcoin. Yes, mining consists of solving math problems, and yes they are rewarded with money. But that concept does not define the premise of bitcoin, just one aspect of many. Unlike anything we’ve used before, bitcoin challenges the way we think about how money stored and transferred in the 21st century. At its core it is a technological innovation that allows for the bitcoin application to be built on top, and because it is novel people have yet to fully wrap their minds around it. It may be a hundred years before people truly ‘get’ bitcoin, it may never happen. But hopefully this article helped clear up some misconceptions you may have had about bitcoin. Leave comments with some of your favorite misconceptions! In response to yesterday’s Congressional Hearing on Bitcoin in the House’s Small Business Committee, I wanted to do an analysis on the volatility of Bitcoin. But first, it is important to note the well received comments in the hearing such as Jerry Brito’s comment, “Like the Internet itself, Bitcoin has the potential to be a platform for the kind of permissionless innovation that has driven so much of the growth of our economy.” On behalf of the Bitcoin community, coinbase‘s Director of Business Development and Sales, Adam White, also pointed out the potential for business of all sizes to use bitcoin for “the elimination of fraud, reduction of transaction fees, and monetization of new markets”. Yet despite much of the hype and excitement there still exist some risks, points out Mark Williams, a risk management expert from Boston University. He refers to the “extreme price risk” of Bitcoin, specifically with its volatility. So I decided to do some of my own research and see how this “extreme” volatility really affects merchants using Bitcoin as a payment processor. I ran an analysis using bitcoincharts historical prices in 5, 15, and 60 minute intervals to calculate volatility. It is within these windows that volatility is relevant to a merchant accepting a payment in Bitcoin (i.e. using the coinbase API). 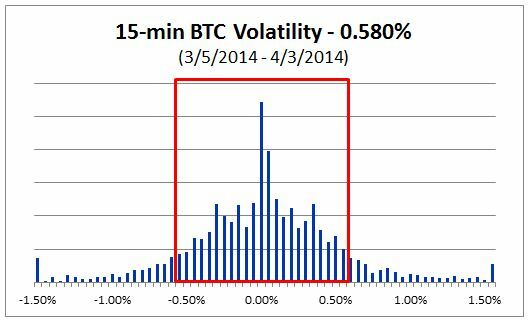 The difference between the 5 and 15 minute volatility is small, both of which are about 0.5% volatility. This means that a $100 Bitcoin payment has a 94% probability of being between $99 and $101 within the first 15 minutes (2 standard deviations from the mean). Considering that there is an equal likelihood that the price rises slightly as opposed to falling slightly means that over time, this should all balance out! So there seems to be insignificant risk for accepting Bitcoin after all. Another point worth noting is that over time, the volatility of Bitcoin has reduced dramatically. 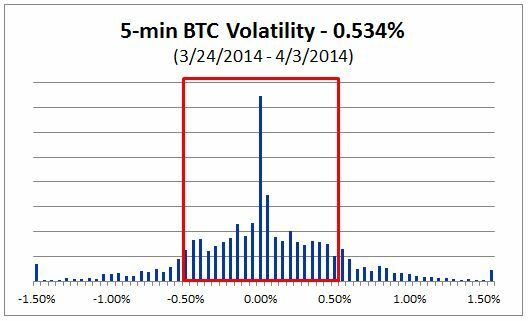 In March 2013, the 1-hour volatility was 2.37% as opposed to the 0.98% in March 2014. This phenomenon is largely due to the fact that Bitcoin is more densely traded. As its acceptance continues to rise, volatility will continue to fall. So for now, we will watch volatility closely but not lose any sleep over it. I’d like to take this as an opportunity to announce the launch of MyCoinSolution. 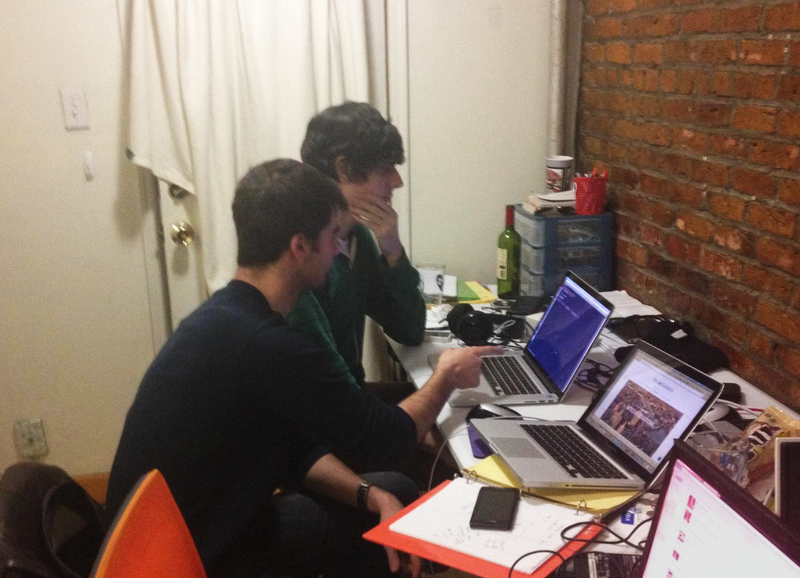 This is the culmination of many months of planning, brainstorming, and experimenting with our passion: Bitcoin. Joseph, a co-founder and technology guru, has spent much of his time developing for the popular alternate crypto-currency, FlorinCoin. And I, Adam Kitain, have been explaining and translating Bitcoin concepts to my less tech-savvy friends for more than a year. So now the time has come for this inevitable and unstoppable partnership between Joseph’s profound tech skills and my charm and good looks. We’re excited to offer Bitcoin consulting services which include helping you understand Bitcoin, determine if it’s right for you and your company, and even implement a Bitcoin solution tailored to you. If you’d like to learn more, please reach out to info@mycoinsolution.com or visit our website, http://www.mycoinsolution.com. 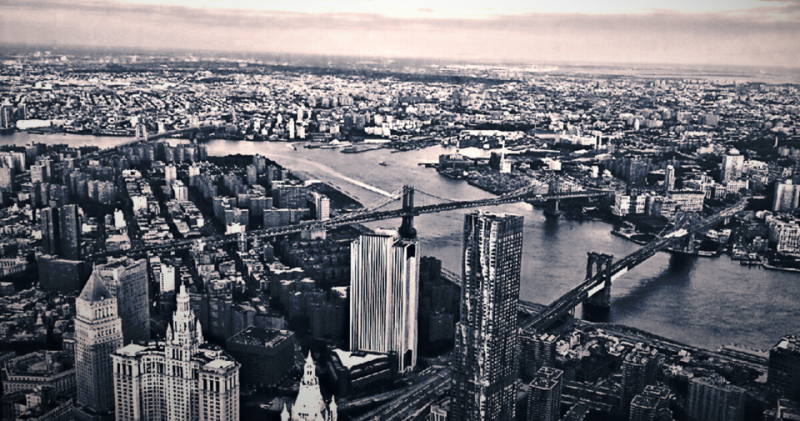 We are based out of NYC and more than happy to discuss the future of your business!